Babette is owned by Nico Goodden and is a fully restored 1964 2CV AZAM, which makes her a historic vehicle at the grand age of 53. Born in France at the Citroen factory in Levallois near Paris, she spent the first 23 years of her life, 700km South, near Carpentras in the Vaucluse region. These were ideal dry conditions for a 2CV, notorious for their rust-prone chassis. Although it has to be said that 60's models such as Babette were built on a much higher quality metal than the later 80's models know to fail MOTs as early as 5 years after purchase. As you can see above Babette was actually born (and nearly ended her days) Blue Monte Carlo (ref. AC605) described as a subtle blue with a hint of gray. 1987: Made her way to Germany where she spent 20 years during which she underwent a full restoration from the ground up. 2007: Sold to a new owner based in England. She was sent across the channel in July. 2008: Appeared on the BBC where she was driven by Top Gear's James May in James May's Big Ideas. 2015: Bought by me not far from Preston in the UK and made her way to my native Dorset on the back of a truck. Since then Babette has enjoyed a relaxed life and a lot of social media love from Citroen and Citroen fans all over the world. 2018: Me and my wife Chrystall are planning the road-trip of a lifetime on-board Babette. We will drive slowly, 2000 miles in 30 days, from Dorset to Mangualde in Portugal where the last 2CVs were produced, documenting this amazing journey along the way. We'll indulge in our passion for food, rediscover the country where I grew-up and enjoy life as it should be enjoyed, slowly with people you love. The 2CV AZAM (2CV AZ-AMéliorée or improved) was introduced at the March 1963 Salon de l'Automobile de Geneve and produced for four years until April 1967. 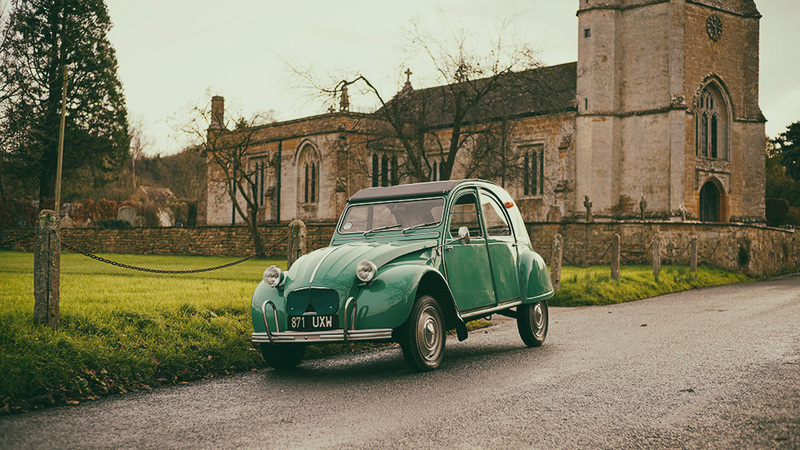 It was the first 2CV model to feature improvements in comfort and elegance, a marketing effort from Citroen at the time to distance the 2CV from its post war austerity origins. Numerous polished aluminium strips adorn the 5-rib hood, the lower bodywork, the doors, the windscreen bay, window seals and bumpers. Other features include loop-shaped (or paper clip) chrome tubes on its front and back bumpers, chrome hubcaps (from the Citroen AMI 6) as well as chrome windscreen wipers. Slate Blue (replaced by the Blue Monte Carlo in 1964). The large V-shape white bakelite steering wheel was manufactured by the Quillery accessories brand. On all previous models, the steering wheel was made of metal which would both freeze your hands in the winter and burn them in the summer. On the dashboard, the speedometer is positioned right above the fuel gauge. Prior to this model, fuel was monitored with the help of a fuel measuring rod inserted directly in the fuel tank. The 1964 is the last of the 2CV AZAM to sport front rear-hinged “suicide doors” which were replaced in December 1964 by front-hinged doors. Finally, it is missing the third side window which only appeared from September 1965 until 1990 when production ended for all Citroen 2CVs. It seems from my research that Babette is one of only five of her model and year left in the UK, especially in such good condition.